Agave Syrup products can come in many different forms, and they have different characteristics depending on the form. They are also better suited to certain foods and drinks depending on this form. This article is a guide for understanding what different Agave nectar products are out there and their properties and health benefits. We also provide advice on how to use these agave product in your daily cooking and give recommendations on dosage for substituting agave products for sugar or honey. If you are new to Agave, we also recommend reading our introduction articles on types of Agave and different uses for Agave. Agave nectar (also known as agave syrup) is a natural vegan and gluten-free sweetener in the form of a liquid, and its texture resembles honey. The main recommendation for consuming it is using agave nectar instead of sugar or honey. There are different types and flavors of agave nectar depending on the way it is made. Two main types are natural agave nectar and wild agave nectar. Both types can also vary in color – they can be found in light, amber and dark colors. The uses for Agave nectar are very broad and suitable for most diets and tastes. See here for a guide on the different uses for Agave nectar. Agave granulated sweetener, also known as sweet agave powder, is produced in powder form. In order to make the agave granulated sweetener, the same agave syrup is used, removing all moisture from it by drying it out. In this way, it comes as a sugar-like dried powder and still preserves its strong flavor. It is perfect to use for sweetening products that require their texture to remain the same. 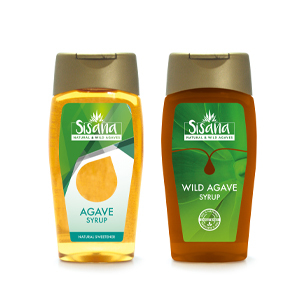 At Sisana, there are four types of sweet agave powder available: added with Minerals, added with Vitamins, added with Collagen and Brown, as well as four flavors: Natural, Caramel, Vanilla and Chocolate. Please have a look here to see the full variety of types on offer. Natural agave nectar is extracted from plants which are grown on farms and is mixed with Cane sugar juice. This production method gives it a more neutral taste than other sweeteners and is perfect for substituting agave nectar for sugar. In comparison to other sweeteners, it also does not have any bitter aftertaste. Moreover, it has a low Glycemic Index (GI) and is high in fructose. It is a great choice for sweetening drinks. Please see here for our selection of Natural Agave Syrups. Wild agave nectar is made from agave plants growing in the wild. Our wild agave nectar is amber in color and has a natural, rich flavor. It is unfiltered and full of minerals. As well as natural agave nectar, it is high in fructose and has a low GI. Because it is 1.4 times sweeter than regular sugar, you can use less of it when substituting for sugar. Adding wild amber nectar to desserts and other products requiring high amounts of sugar is most beneficial. Our Wild Agave Syrups can be found here. The main difference between natural and raw agave syrup is the temperature at which it is produced. Raw agave nectar is made at below 48 °C, what gives it a subtler taste than that of the natural agave nectar. Because of the producing method, it is a great option for raw food followers. Raw agave nectar, the same as natural agave syrup, is low in glycemic index, high in fructose, is gluten-free, suitable for vegans and is non-GMO. It is perfect for mildly sweetening beverages, cereal, oatmeal, smoothies or for cooking meals at a low temperature. Different agave nectar uses are possible, as different syrup varieties (light, amber, dark, raw) can be produced only by controlling levels of filtration of salts and minerals, and the temperature at which agave nectar is cooked. Below we provide examples of how to use agave nectar of different types and flavors. Light Agave Nectar has a mild natural flavor and so can be used in dishes where natural flavors need to be preserved without altering them by adding sweetness. It is also an ideal option for sweetening drinks. Similar to Light Agave Nectar in its mild flavor is Raw Agave Nectar, which can be used for the above mentioned food options. The difference is that Raw Agave Nectar is preferred by raw food diet followers, as it is produced at the temperature below 48 °C. Amber Agave Nectar has a subtle caramel taste. It is more suitable for deserts and stronger flavor sauces. Dark Agave Nectar has a stronger caramel flavor and is best to use for meat and seafood dishes. It is also the perfect topping for pancakes or richer flavored deserts. Within the above groupings, it is also possible to add further particular flavourings. At Sisana, our Natural and Wild agave nectars are available in 6 further flavors: Natural, Caramel, Maple, Honey, Vanilla and Chocolate. Since agave nectar is 1.4 times sweeter than sugar, it means you will need to use much less nectar in your food or beverage. The general recommendation for substituting agave syrup for sugar is to use 2/3 of the amount of white sugar you would use. If using agave nectar, it is advisable to reduce other liquids by a 1/4 (liquids are reduced since agave has a lot of moisture itself). However, if using Agave granulated sweetener, this is not necessary. The same proportions are used for Demerara Sugar, Turbinado Sugar, Evaporated Cane Juice, or Sucanat. When substituting agave nectar for honey, equal amounts can be used, and following a 1:1 ration will work perfectly.